- The latest headlines are daunting; the Brexit process is a ship without a rudder. What's next? Customs union? General election? Second referendum? - Yesterday produced the fifth-largest gain by the US Treasury 10-year yield since US President Donald Trump's election. - Retail traders continue to fade US Dollar advances. Looking for longer-term forecasts on the US Dollar? Check out the DailyFX Trading Guides . The US Dollar (via the DXY Index) is continuing its strong run of late, posting its seventh gain over the past eight trading days. Ongoing economic concerns out of Europe weigh on the Euro , while the shambolic process that is Brexit is impacting all of the European currencies, not just the British Pound . Elsewhere, the Australian Dollar is reeling after the Reserve Bank of Australia's dovish shift (although, given what the RBNZ did last week, as much was anticipated). After gaining over 1% yesterday, US stocks are flat around the open. ‘The End of May Before the End of April?' Brexit Latest Another round of failed votes in UK parliament has seemingly left the Brexit process a ship without a rudder. No consensus has emerged for any option, although it's clear that the closest UK parliament would get to an agreement would be through a customs union. Otherwise, the second most popular option was for a second referendum but if Brexit hasn't been defined, what would people vote for? A colleague of mine passed on a cheeky quote he heard yesterday after the Brexit votes: 'for the first time, the end of May could come before the end of April. And while it's true that UK Prime Minister Theresa May is increasingly unpopular within her own Tory party, there's little reason to believe that a general election will solve any of the problems in UK parliament; polls show that neither Labour or the Tories would be able to govern with a majority. What's next? Customs union? General election? Second referendum? All are possibilities. The only thing that seems guaranteed is more volatility for GBP-crosses. US Economic Data Hasn't Been Bad…Quite the Opposite All of the hand-wringing about Q1'19 US GDP growth may be for naught. The preliminary March US Durable Goods Orders report beat expectations mildly, but to look at one point of reference would be to look at an individual tree within the forest. US growth expectations have seen a significant rebound in recent weeks. 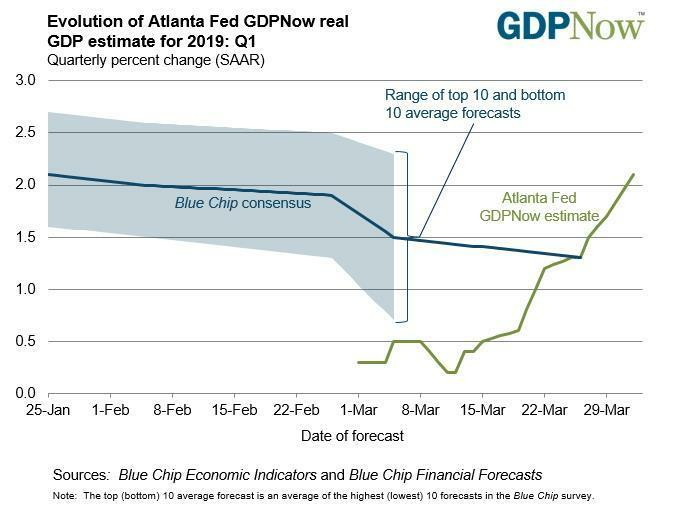 Based on the data received thus far about Q1'19, the Atlanta Fed GDPNow forecast is looking for growth at 2.1% after hitting a low of 0.2% in the second week of March. The next update to the Q1'19 forecast will be released later today. US Treasury 10-year Yield: Daily Timeframe (June 2016 to April 2019) (Chart 1) The bump in US growth expectations may finally be starting to filter through into US Treasury yields, a notable development given that US rates may be bottoming out now that Q1'19 GDP estimates have crossed back above 2% annualized. Price action yesterday in US Treasuries was particularly noteworthy given the scale of the advance: it was the fifth largest single day gain by the 10-year yield since US President Donald Trump was elected in November 2016. DXY Index Price Chart: Daily Timeframe (June 2018 to April 2019) (Chart 2) Yesterday it was noted that 'For the broader DXY Index, price has been trading between 95.85 and 97.35 every day since February 4…traders should be on alert for potential breakout opportunities over the coming sessions. The DXY Index has started to eclipse 97.35 to the topside, opening up the possibility for a move back towards the 2018 highs near 97.72. Bullish momentum continues to build with the near-term with price stretching further above its daily 8-, 13-, and 21-EMA envelope while both the daily MACD and Slow Stochastics push higher above their respective signal/median lines. FX TRADING RESOURCES Whether you are a new or experienced trader, DailyFX has multiple resources available to help you: an indicator for monitoring trader sentiment ; quarterly trading forecasts ; analytical and educational webinars held daily ; trading guides to help you improve trading performance , and even one for those who are new to FX trading .